Melaleuca huegelii growing shrub‎ to tree of the genus Melaleuca also known as Melaleuca citrina, Melaleuca huegelii perennial evergreen used as ornamental plant, bonsai or shade tree drought tolerant, can grow in tropics, subtropics, mediterranean or desert climate and grow in hardiness zone 9+. Leaves color green in lanceolate shape in size 1-2cm (0.5-1 inches). 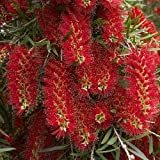 Flower color white, the flower small needle like and grow in inflorescence in bottlebrush shape. 1 Well Rooted of Red Flowing Weeping Bottlebrush Tree.